Still have trouble in how to convert MP3 to WAV with a correct tool? Actually, if you find an efficient way to achieve MP3 WAV conversion that can save your time and energy as much as possible. Then, in this article I will introduce you two simple and easy ways to convert MP3 to WAV file. What's the Difference between MP3 and WAV? As we know, both MP3 and WAV audio formats are widely applied in varieties of media players. Although they both are widely-used formats, there still exists some differences between them. MP3 is a compressed audio format with quality loss. It can reduce your audio size sharply by MPEG Audio Layer 3 technology. Hence it will lose some digital information. While WAV is an uncompressed audio format without quality loss. It’s accorded with RIFF (Resource Interchange File Format) document for saving Windows audio resources. It’s widely supported by Windows application programs. And the standardized WAV audio format has the same quality of CD. If MP3 and WAV are in the same compression rate, the quality of WAV is better than MP3. Tips: If you are a music buff, WAV audio format is your best choice. But when you convert MP3 to WAV, it can’t dramatically improve the audio quality MP3 itself is a lossy format. Next, let’s learn how to convert MP3 to WAV with free MP3 to WAV converter. Free HD Video Converter Factory is used as a technical audio converter. You can convert your MP3 files to WAV freely. Also, you can convert any other audio formats to WAV and vice versa. In addition, you can use it as an audio editor to edit your audio files including cut audio files, merge multiple audio files into one, etc. Convert MP3 to WAV with Free HD Video Converter Factory is your best choice. This software not only converts MP3 to WAV, but also converts any audio format to another audio format like 3GPP to MP3, M4A to WAV, FLAC to ALAC and etc. Please look at the following steps to learn how to convert MP3 to WAV. Before start, please free downloadfree download MP3 to WAV converter on your PC. To start with, you should open the ‘Add Files’ tab. Then click the ‘Add Audio’ button to select your MP3 file. 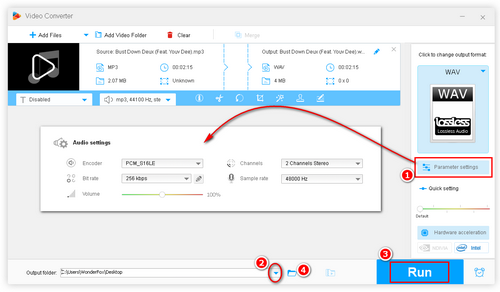 Double click your MP3 file to add it to Free HD Video Converter Factory. Open the ‘Output Format’ tab, then choose WAV format under the ‘Audio’ tab. Here you have many output format choices, WAV, FLAC and ALAC are the best audio format with original quality preserved. After choosing output format, you should set the destination path by clicking the yellow folder. Finally, you should click the ‘Run’ button, then you will get a WAV format audio. 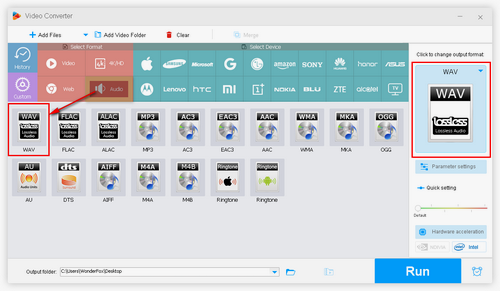 You can also use Free HD Video Converter Factory to merge MP3, cut audio files and download MP3 online. If you feel complicated to download a software, here I will introduce an online MP3 to WAV converter for you. This site provides you an easy way to convert MP3 to WAV freely. 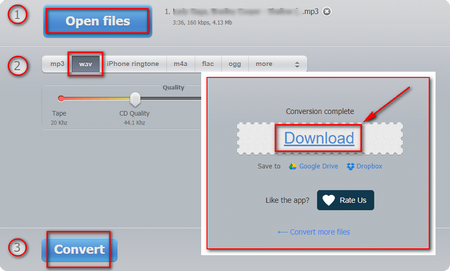 Now follow me to find out how to convert MP3 to WAV with this website: https://online-audio-converter.com/. Before start, you should open this website. Step 1: Firstly, you should click the ‘Open files’ button to choose a MP3 file. Step 2: Click WAV format that you want to choose. Step 3: Click the ‘Convert’ button and it will change the format, then it will run to another webpage. Step 4: When the conversion complete, you should click the ‘Download’ button. It will download to your PC. This webpage also free WAV to MP3 format. 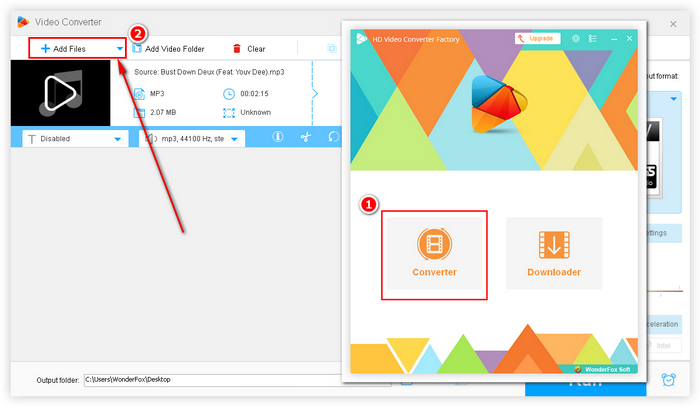 I introduced the above two simple and useful methods, you can choose either Free HD Video Converter Factory or Online Audio Converter to convert your MP3 to WAV. You may have met with video format problems or other video playback issues. 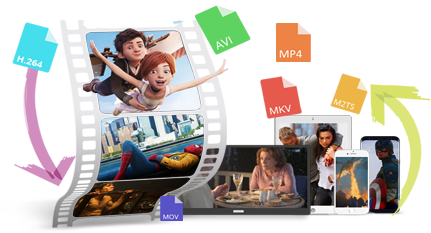 HD Video Converter Factory Pro can solve your video format problems as well as edit your videos, such as merge videos, cut videos and add subtitle for videos. And this software supports to download videos from 300+ hot sites by URL.